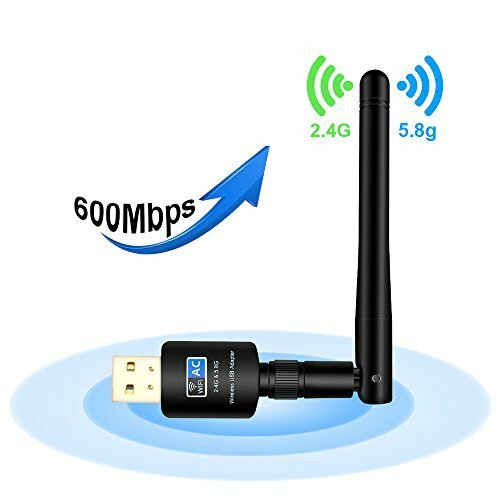 Wireless adapter brings you a tiny way to get speedy next generation wifi connections, by connecting it to the USB 2.0 interface of your PC, laptop or Mac, you can establish 433Mbps connection at 5.8GHz radio or 150Mbps connection at 2.4GHz radio with your wifi router. The 5.8GHz band or 150Mbps over the 2.4GHz band, it is ideal for seamless HD streaming, online gaming and other bandwidth-intensive tasks. Enjoy more convenience with your wifi USB adapter, with AC600 wireless AC adapter, you can shift between 2.4GHz and 5.8GHz wifi bands to avoid interference and have optimal wifi internet connection for your PC, laptop or Mac. Works with any wifi routers, by using AC600 AC wireless adapter, you can upgrade your PC,laptop or Mac to work with the latest AC wifi router for faster speed and extended range. External Gain Antenna:The external 2dBi omni-directional antenna provide strong penetrating ability and stability. Enhance the WiFi peformance and extend range. Good Service: USB Wireless Network Adapter Support Windows 10/8.1/8/7/XP/Vista (32-bit/64-bit),Mac OS X 10.4~10.12, We offer 12 MONTH WORRY-FREE WARRANTY, if you have any problems when using, just contact us. We must GIVE YOU A REPLACEMENT or REFUND UNCONDITIONALLY ! If you have any questions about this product by Fancy Room, contact us by completing and submitting the form below. If you are looking for a specif part number, please include it with your message.